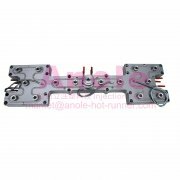 When in the runner making of hot runner system manifold ,the runner of Hot runner manifold should be reasonable optimization. An optimization design of runner is to ensure that the hot runner system has reasonable plastic pressure, reasonable shear rate and shear stress, reasonable runner to reduce the time when the volume of plastic stay in the hot runner system and speed up the color change, and reasonable friction to heat produced by the plastic melt temperature change, etc. The running making mostly made by drilling (gnu DRILL) of finish machining method, the productivity is higher. But this method of drilling can only make linear runner. In this way the most important thing is to notice when the place is two SPR intersect to light the whole round, also need to polish the sprue tube wall, to avoid runner corner solution for a long time thermal metamorphism, eventually lead to produce inferior products. Another way to make a runner board is processed with milling method. The runner is composed of upper and lower two pieces of steel block. first, with the milling method respectively in the two and a half piece of steel piece of work out side runner, then put the up and down through the special welding or other mechanical methods appeared. The benefits of this runner is it can be made within any shape is not just straight sprue form, to increased the flexibility of plastic flow control, and there is no flow corner. but users are not easy to clear the runner system directly. Here is the ways of Runner making of hot runner system manifold .